Software with Seamless Interface to Active Directory. 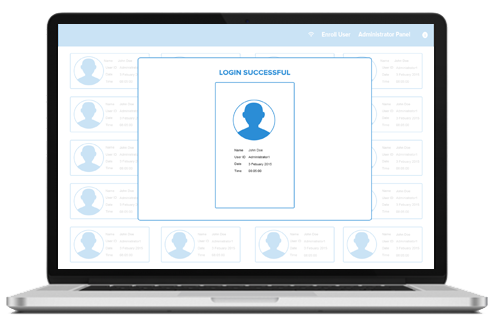 Bayometric’s biometric Single Sign –On software (SSO) is a strong authentication and identity management solution which relieves the burden of password management while providing a more convenient way for users to access their computer or the network. Enterprise Single Sign on allows users to securely connect into the enterprise. It is a cost effective, server based back-end that offers enterprise wide identity management that can be easily deployed and managed by your IT department. The fingerprint single sign on solution seamlessly interfaces with Active Directory, ADAM, Novel eDirectory, Standard MMC console plug-in, enabling IT personnel to quickly and easily administrate biometric login information. Centralized user enrollment, credentials & access rights management. Easy client components installation via AD group policies. Supports Citrix, Citrix XenDesktop, XenApp desktops and applications, VMware, Terminal Services and Remote Desktop Protocol (RDP) environment. Supports all enterprise level applications, such as teminal emulators, SAP, Oracle, Chrome, IE, Firefox, ERP, CRM. Authentication, encryption and most other user operations are logged into the Active Directory or the ADAM server. Produce audit trail of user operations to help comply with governmental regulations such as HIPAA, Sarbanes-Oxley, and the Gramm-Leech-Bliley Act. The SSO portal provides organizations a well-integrated strong authentication and identity management system that ties easily into their existing infrastructure. Enable users to share a physical workstation using individual authentication and real-time context switching. Shared workstation mode support. For managing user accounts and settings and management of authentication hardware such as the TPM. Incorporates the generation of secure digital certificates (PKI) as part of the enrollment process. 40+ readers supported like Digital Persona UrU 4500, Secugen, Lumidigm, Nitgen etc. Supports fingerprint scanners that are built-into laptops. Extends Windows Logon protection (GINA for Windows XP and Credential Provider for Windows Vista/7). Policies are configurable per user or on a per machine basis. Allows policies to be overridden by an end user or enterprise help desk in emergency situations. Enable users to manage their own network password resets by answering secret questions. Secure individual files and folders. Uses the existing PKI encryption technology and the CryptoAPI architecture that is already built into Windows. Supports fingerprint scanners, palm readers, smart cards, authentication tokens, proximity badges and other proprietary security devices. Supports smart cards from major suppliers such as Gemalto, G&D, ActivIdentity, AET and Trusted Platform Modules (TPM). Supports Windows XP SP3, Vista, 7, 10, Server 2003, Server 2008, 2012. Relieve IT staff of the burden of managing user access and resetting passwords across a wide range of applications. Enhance user productivity by freeing users from having to remember passwords for multiple systems and applications. Increase productivity & Secure Devices and Users! Backed by a team of Experts with extensive experience building enterprise-ready Biometric Solutions. Free Updates. Outstanding Support.